The artist creates something out of nothing. And the jewelry artist does the same, but also imposes this act on the person who wears the result, who in turn, decides whether to display or demonstrate its desirability and wearability, and all within a particular context or situation. So, we start with nothing into something. That something takes up space. That space might be filled with objects we call points, lines, planes, shapes, forms and themes. With whatever that space is filled, and however these objects are organized, the space and its composition convey meaning and value, communicated not merely to the artist, but as importantly, to the wearer and viewer, as well. As Design Elements, it is important to differentiate among the power of each of these objects to focus, anchor, direct, balance, move, expand, synergize, coordinate, conform, bound, connect, and violate. The artist creates something out of nothing. And the jewelry artist does the same, but also imposes this act on the person who wears the result, who in turn, decides whether to display or demonstrate its desirability and wearability, and all within a particular context or situation. So, we start with nothing into something. That something takes up space. Space separates and connects us with things. It is these arrangements and contrasts which allows us to find meaning, feel connected, recognize implications. That space might be filled with points, lines, planes, shapes, forms and themes. We might add color, texture and pattern. 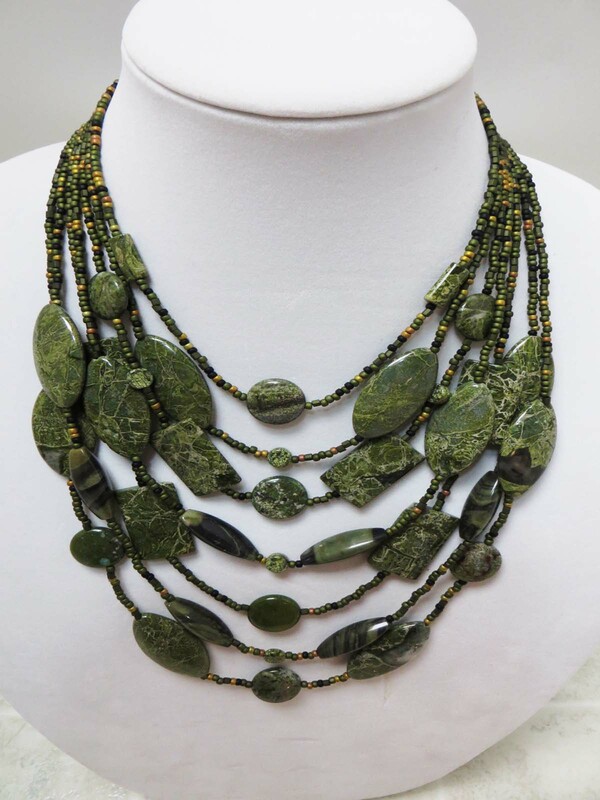 With whatever that space is filled and organized, the space and its composition convey meaning and value, not merely for the jewelry artist, but as importantly, for the wearer and viewer, as well. Filling space with objects will always create a level of tension because any viewer will feel compelled to make sense of it all. This is work. This is risky – what if the person evaluates poorly or makes a mistake or shows bad judgement or is compelled to pretend to understand? It’s always easier (and perhaps safer) for the person to turn and look away. To reject the jewelry. Not wear it. Not buy it. Jewelry designers do not want people to avoid their creations. So, it is important to also anticipate what happens when more objects are added to the composition. Further adding to and organizing and arranging these points, lines, planes, shapes, forms and themes into a design will exacerbate things even more, increasing the risk, but also the reward, for the viewer to maintain their stance, keep looking at it, and keep trying to figure out what it all means, and what it all means for him or her. Meaning and value emerge from some type of this dialectic-type interaction, first between artist and self, and then between artist and client, often reflected in the selection of materials and choices about arrangements. The meta-qualities and inspirations and aspirations underlying these decisions then transition into forms and themes. This emergence is contextually bound by shared understandings about whether the piece should be judged as finished and successful. Let’s begin to decode points, lines, planes, shapes, forms and themes. The jewelry designer’s ability to learn about, manage and control space is perhaps the most critical skills to develop. Points, lines, planes, and shapes are independent design elements, and forms and themes are their dependent cousins. Independent design elements function a little like vowels in the alphabet, and can stand alone and be expressive. Dependent design elements function more like consonants, and typically require some combination with independent elements to have fully formed expressions. Whatever their independence or dependence, these design elements are progressively interrelated. As we move from point along the list to theme, we increase our power to express meaning, establish value, create tensions, and resonate. As we use more than one of these elements – either more of the same element or combinations of different ones — within the same composition, we also are increasing our artistic and design control, power, and ability to show intent, establish meaning, and achieve a successful result. These design elements discussed here are considered objects to the extent that they are things to be positioned and manipulated. They are considered parts of structures to the extent that they are part of some organization or arrangement. Both objects and structures express meaning and value, but structures moreso. Themes are explanatory meanings resulting from the interpretation of forms. They may be literal or abstract. They may be symbolic and layered. They may be culturally- or situationally-specific. Forms are especially coherent combinations and arrangements of points, lines, planes and shapes. They may be distinct or overlapping. They may be fully formed or partially formed. They reflect broader, deeper meanings and reflections – something considerably beyond the meanings of the component parts. Shapes are bounded lines and planes, delimiting spatial units which convey much more meaning than their individual component lines and planes could ever suggest on their own. Shapes function in 2- or 3-dimensions. Shapes are interpretable, whether they are immediately or easily recognized, or not. Planes are defined by the intersection of 2 lines, or the presence of 3 noncollinear (not on the same line) points, or 2 parallel lines, or a line and a point not on that line. Planes suggest the ideas of existence, thought, and development. Planes imply the possibilities for movement and dimension. 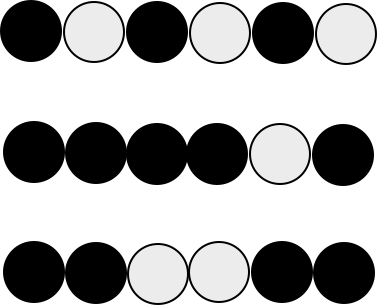 Lines are defined as a series of points. Lines imply the possibilities for boundaries, directions and movement. They can be used to measure things. They can demarcate that which is OK and sacred from that which is unacceptable or dangerous or profane. Points change the nothingness of space into something-ness. They can focus the attention. Points are the simplest geometric elements which imply the possibilities for imposing individual intent, meaning and value on the universe. The presence of two or more points can suggest relativity. The jewelry designer cannot ignore any of this. As design elements, points, lines, planes, shapes, forms and themes are an integral part of the jewelry artist’s tool box. 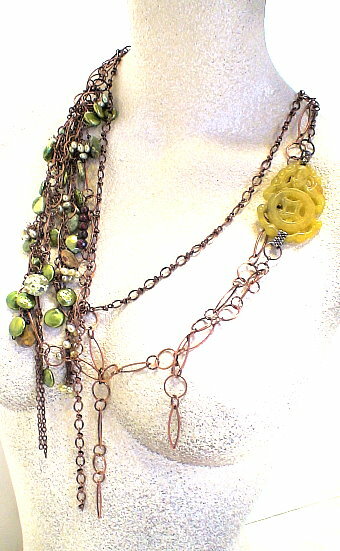 As elements within compositions, they are to be constructed or manipulated into principled arrangements we call jewelry. They allow the artist to show his or her hand. They are some of the major building blocks the artist uses to convey meaning and connectedness, show intent and inspire others. 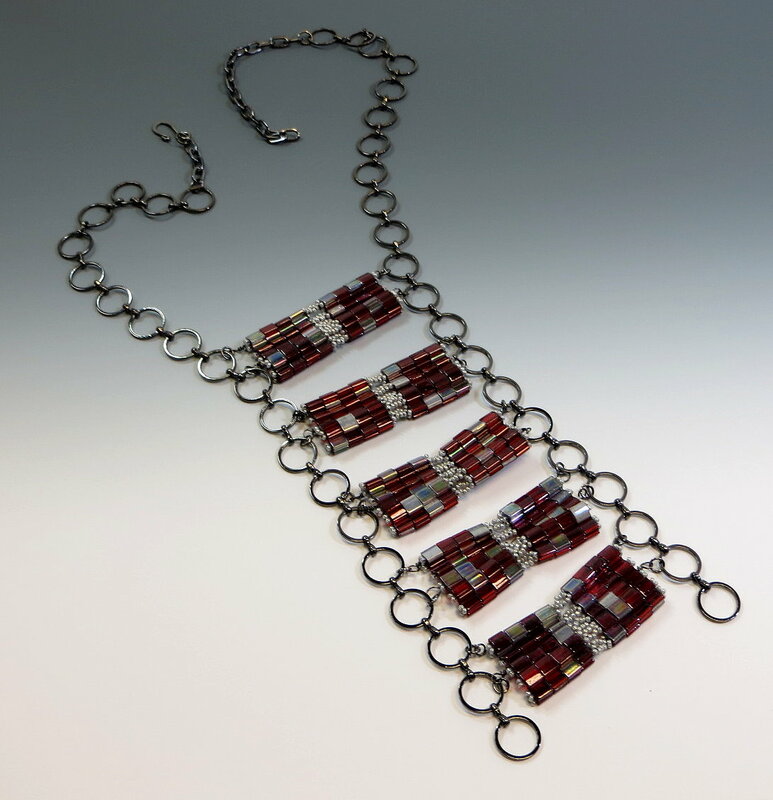 As used with Principles of Composition, Construction and Manipulation, it is important to understand how each of these elements can enhance or impede the artist’s ability to arrange objects to achieve a finished and successful piece of jewelry. Each can support or detract from a compelling arrangement. The designer does not have to use all of these elements. But the designer does need to know what each can and cannot be used to do. The designer must develop that intuitive and fluent knowledge how each of these elements function. The goal of jewelry design is to communicate. Communicate the artist’s inspirations and aspirations. Communicate the choices made to turn aspirations into concrete products. Communicate the self-identifying relevance of jewelry pieces to the wearers. Communicate the socio-cultural relevance of jewelry pieces both wearers and viewers. Finally, each element should be used parsimoniously (that is, that Goldilocks point of just right), to attain a level of resonance. 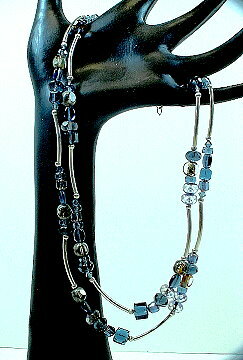 Our jewelry, at the minimum, should evoke an emotion, and more importantly, go a little beyond this and resonate. In math, the point exists but has no mass. 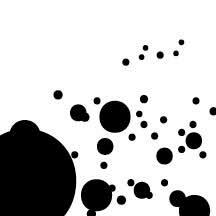 However, for this and our other design elements discussed in this article, we use a looser definition in art and design. The point is the simplest geometrically based design element the artist can use to create something out of nothing and draw someone’s attention to a piece. The point can be very small, or medium or large. 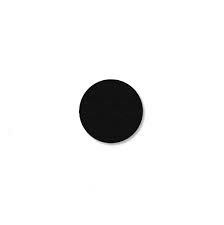 It can be a simple circle, or a blob, or a square, or anything that might get interpreted as a point. The point is the building block for everything else. Every mark we can make will be a combination of one or more points. Every line, plane, shape or form is essentially a point, regardless of its size. Most importantly, the point calls one’s attention to a place where no attention was called for or placed before. They create a reference point. With 2 or more points, that reference point builds up much more meaning. It shows relativity in a relationship. It suggests distance and direction. 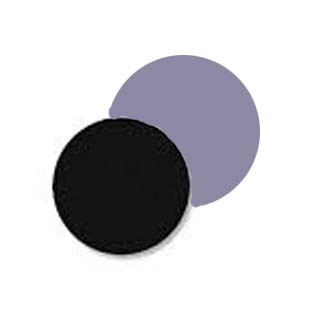 It can suggest layering or dimension – think two over-lapping points. Relationships between and among points pose two especially important meanings. One, the relationship that emerges about proportions of the point(s) to the space around it. Two, the relationship that emerges about the position of the point(s) within the space around it. Proportions and positioning. The jewelry designer usually starts with a collection of different kinds of points with some determination and a lot of experimentation to arrange them in some pleasing way. Some points might be various round beads. They might be beads of different shapes. 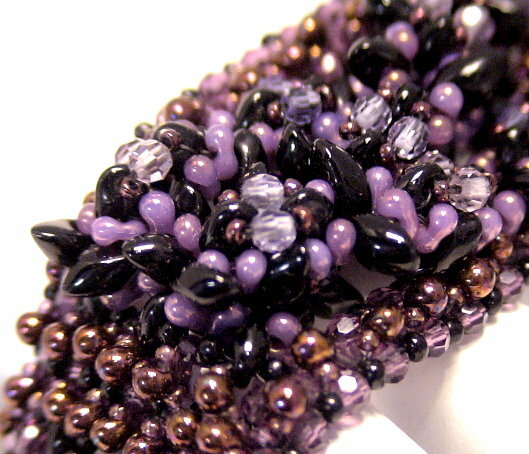 They might be a clustering of beads into some shape or form. They might be a fully formed component. The artist thinks about the distribution and balance of points. Sizes, relative sizes, shapes and variety of shapes are pondered over. 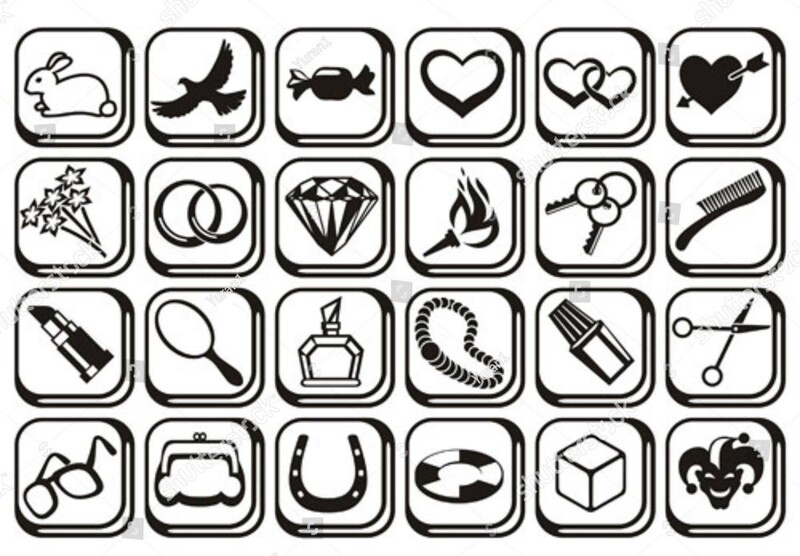 Then points are placed, usually, with jewelry, in some kind of circle or silhouette. 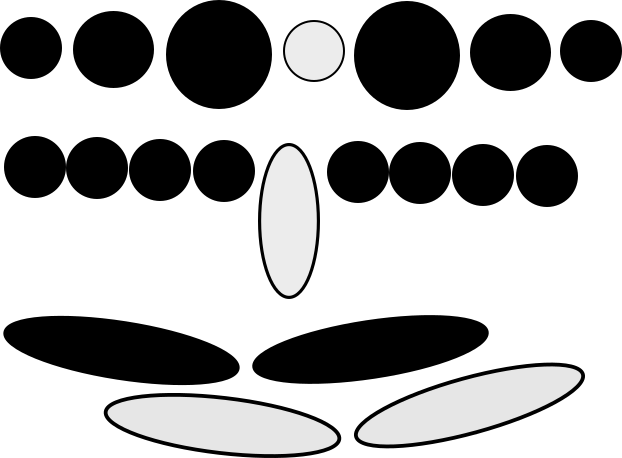 Their placement may establish a sense of balance, such as symmetry. Their placement might create a rhythm, either fast or slow. The artist determines where any emphasis should go. 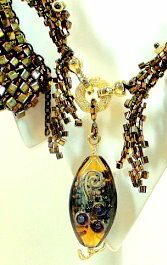 Often the artist uses a pendant drop, some variation in proportion, or some color placement effect to call a viewer’s attention to a certain part of the jewelry. These function as points. The artist determines how emphasis, size, proportionate relationships and placement affect how the piece will be interpreted and decoded by others. In what way(s) does the point influence the space around it? Should attention be focused or directed? What kind of rhythm should be established? Should a feeling of closeness, apartness, integration or skew be created? 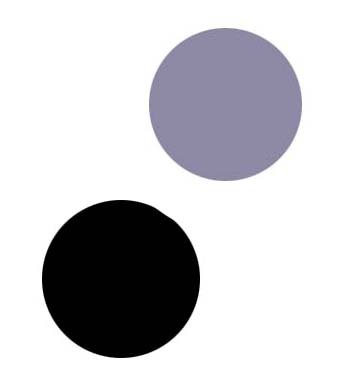 Have the dots contributed to a sense of symmetry or asymmetry? 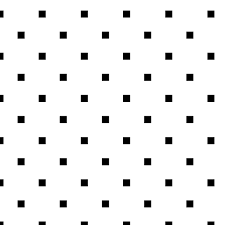 Do the points lose their “point-ness” and suddenly get perceived as a lines or shapes, when they move closer together? The artist decides the number of points to be used, and decides their parsimonious selection and placement. That is, the artist decides when enough points are enough. Using more than one point adds a level of tension to the piece. There is a competition for space and how position and proportion will affect interpretation of the artist’s intent, whether the piece feels finished, and whether the piece is seen as successful. Overlapping points create a figure/ground perspective. They change the nature of the space and the person’s interaction with it. They add depth. 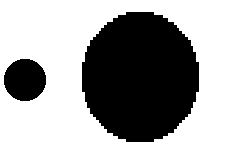 Overlapping points might get re-translated into a new point, or into a new shape. 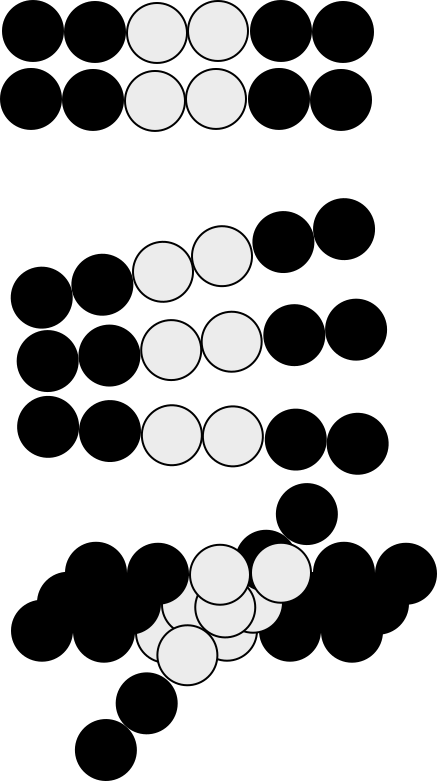 Lines are defined by the connections between 2 or more points. Lines have length and width. They connect, they divide, they direct. The points along the line can attract or repel each other. They can emote strength, weakness, or harmony. They can excite, muddle or confuse. They can be actual or implied. Where points are about emphasis, lines are mostly about direction and movement. A line is not attracting you to a point in space, but rather, it is directing you. 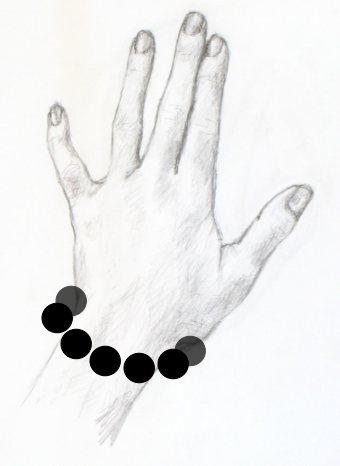 Lines prevent the viewer from getting stuck staring at one point in your jewelry composition. They encourage the viewer to move around and take into account the whole piece. Lines both separate and join things. They establish a silhouette. They demarcate boundaries. They signal a beginning and an end, or travel in one or both directions all the way out to infinity, and perhaps beyond. Lines can violate boundaries, or establish walls around something. They can curve and curve around things. A line which curves around and connects its beginning to its end becomes a circle. 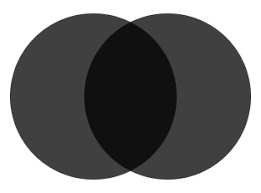 If the line delineating the circle becomes too thick and fills all the negative space, it becomes a point. 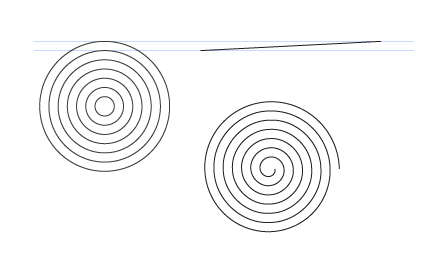 If the curving line does not meet itself, beginning to end, it becomes a spiral. A curved line usually conveys a different sense of beauty and romance than a straight line. As lines become thicker, they begin to take on the characteristics of planes. To maintain their identity and integrity as lines, they must always be longer than they are wide. Changing the ratio of the length to the width has the greatest impact on how any line will be perceived and understood. As lines become thinner, they more and more emphasize the quality of direction. As both endpoints of lines seem to extend towards infinity, they emphasize movement. 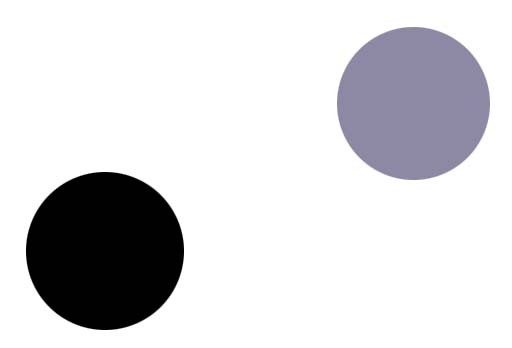 If one endpoint is fixed, while the other endpoint is allowed to extend towards infinity, more tension is perceived as the space around the line is interpreted by the viewer. Two or more lines together create a measure of things. People try to make sense of each line, sometimes in combination, but often as individual segments. The interval space between the lines becomes critical in this endeavor. When two lines converge, they create an angle between them. 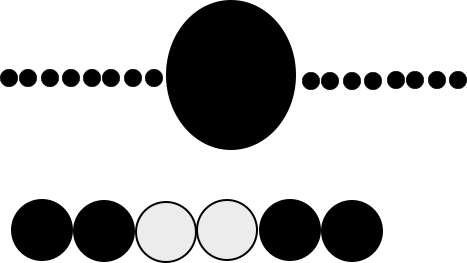 This joint or connecting point becomes the nexus for things moving in two different or altering directions. The angle and juxtapositions of multiple angles can establish a rhythm. Angles smaller than 90 degrees generate perceptions of more rapid movement than angles larger than 90 degrees. 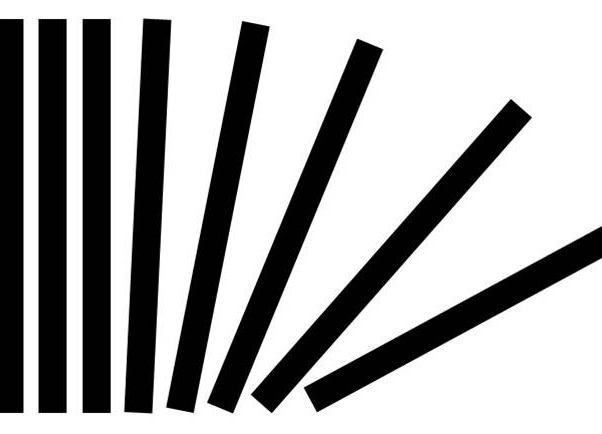 When two lines are separated, they often are perceived separately, each with its own identify. 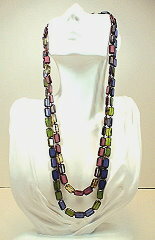 Think of the single vs. the multiple strand necklace or bracelet. The interval between the lines becomes a critical part of the story ascribed to each line separately. It is important how that interval’s negative space is filled up or left empty. It is important how wide that interval is between each pair of lines. Pieces with narrower interval spaces have more tension resulting from how the lines are perceived and thought about. The width of interval spaces between lines creates rhythm. The use of color can further enhance (or impede) this perception of rhythm within a piece of jewelry. Varying the intensity and values of the lines can create dimensionality, where some lines appear to advance and others appear to recede. 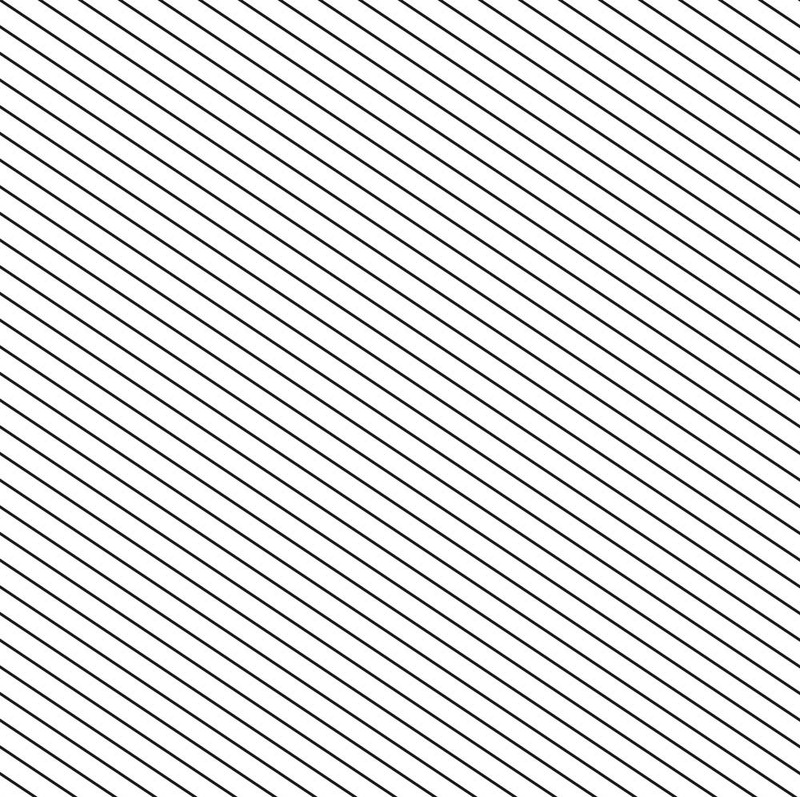 Thicker lines placed close together can change the gestalt, where the viewer’s attention shifts from the original lines to the negative interval spaces, now seen as the lines. 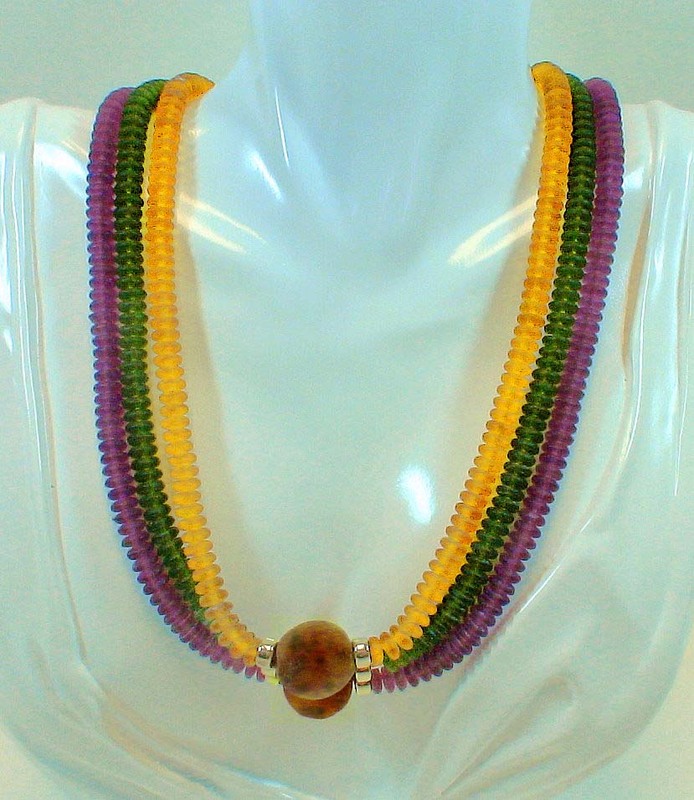 Lines are design elements used to compose, construct and manipulate beads and other pieces into jewelry. They assist the artist in translating inspiration into aspiration, establishing intent, and securing shared understandings about whether the piece is finished and how successful that piece should be judged. We’ve learned that the control over line includes choices about thinness or thickness, finite or infinite, continuous or sporadic, integrated or disjointed, connected or not, and spacing between intervals. 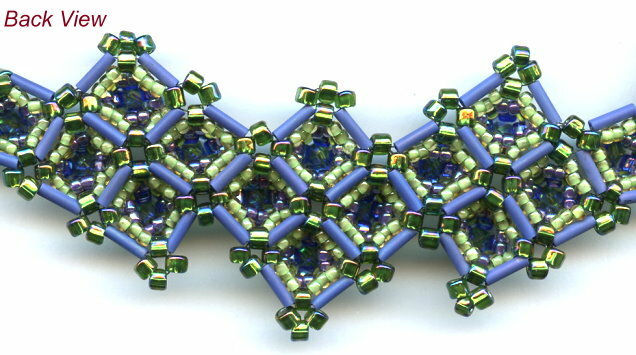 The presence of more than one line, and the chosen attributes of each line, adds more meaning, more complexity, and more opportunity for the jewelry artist to play with materials, techniques and designs. The tensions underlying points get assessed and managed differently by the jewelry artist than those underlying lines. While the point is more about attracting your eye, the line is more about directing it. Points emphasize and focus and anchor. Lines add movement and flow. Points lead us to ideas about balance and predominance. Lines lead us to ideas about alignment, coordination, closeness, grouping. Lines add additional measures of meaning, such as those associated with violation, conformance, span of control, silhouette, dimensionality, boundaries and framing and walls. Planes are used to encompass a space. Planes suggest unity. Planes provide reference and boundaries and direction. They suggest dimension and movement. As such, the use of planes often makes it easier for the viewer to find and interpret meaning of all the other design elements found within or outside that plane. Because of this, establishing planar relationships among design elements can also lead to a measured sense of history and time and timeliness. They can lead to more concrete understandings of context and situation within which the other design elements present themselves, and seek to affect. Planes are not restricted to a single point of view. They allow widespread placement and fragmentation. Planes may overlap. They may be parallel. They may intersect. They may be flat or curved. Their boundaries may be linear or nonlinear. They may have clearly defined or diffuse boundaries. They may be warped and pulled in different directions. Just as lines can be thought of as an accumulation of points, planes can be thought of as an accumulation of lines. As a plane becomes larger, it sometimes takes on the characteristics of a point. If it takes on the characteristics of a point, then its contour takes on more critical importance, diminishing the point-like characteristics, and increasing those of shape-like attributes. For jewelry designers, planes can be seen to have surfaces. 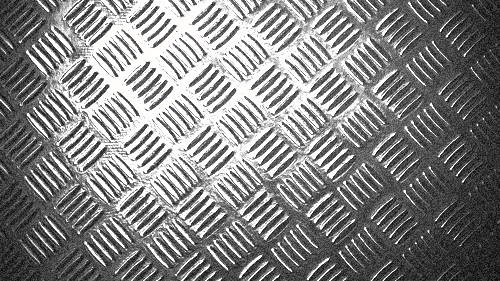 Textures and patterns may be added to these surfaces. Textures involve the placement of 2 or more design elements within the same space and which are seen to somehow relate to one another. Textures have visual impacts. When this structural relationship among textural objects seems to have some order or regularity to it, we refer to the texture as a pattern. Textures and patterns may be 2- or 3-dimensional. They may be regular, predictable and statistical. Or they may seem random and non-statistical. They may be repeated or singular. They may be both visual and tactile. We may see textures and patterns which are layered or not, or smooth or rough. For the jewelry artist, planes can become both a help and a hinderance. They can aid the designer in establishing a coherent point of view. But they can get away from the designer, and allow incoherence and irrelevance to slip into the composition. When we come to focus on the outer contours of a plane, we begin to recognize this design element as something we call a shape. 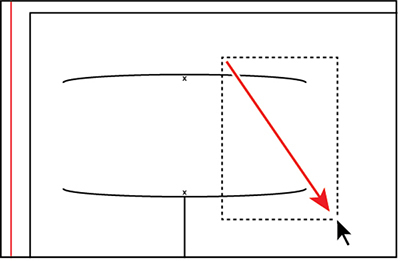 Shapes are areas in 2- or 3-dimensions which have defined or implied boundaries. They are somehow separated from the space surrounding them. Shapes may be delineated by lines. They may be filled or emptied. They may be formed by differences in color values and intensities. They may be formed by patterns and textures. They suggest both mass and volume. Shapes may be organic or mechanical. They may relate to the background, foreground or middle ground. They may be geometrical (regular, predictable contours) or organic, distorted or overlapping, blended or distinct or abstract. 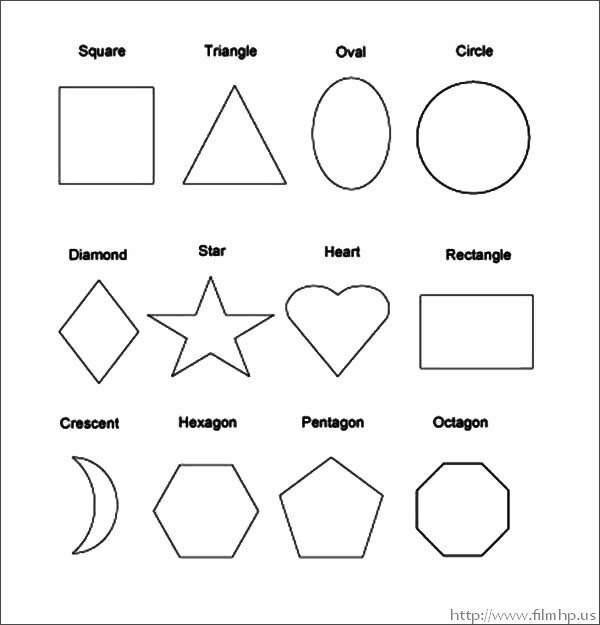 Shapes may be interrelated by angle, sometimes forcing a sense of movement and rotation. More than one shape in a particular space may make one shape appear more active or more important or more prominent. 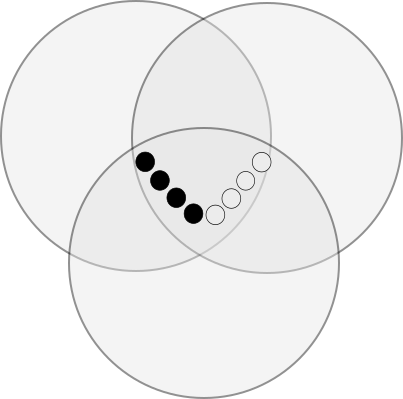 This may change the perception of what that shape is about, particularly when shapes overlap. 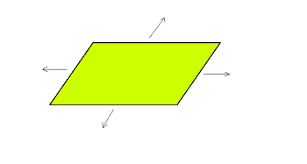 Secondary shapes may seem more point-like or line-like in relation to the primary shape. When we recognize something as a shape, we begin to try to impose meaning on it. Shapes provide orientation. They are very powerful connectors between viewer and object. They may take on attribute qualities, such as masculine or feminine. Shapes have meaning in and of themselves, and are not dependent on the human body for their expressive qualities and powers. When dependent on the human body, they become forms, rather than shapes. Jewelry artists need to be able to relate the shape to the message they hope the shape will convey. The shape should reconfirm, rather than obscure, that message. Part of successfully working with shapes is controlling whether the boundaries are distinct, blurred or implied. Another important part is controlling how the interior space is depicted – such as, left empty and negative, shaded, colored, textured, either partially or fully, densely or not. A last important part is whether the shape represents a 2-dimensional or a 3-dimensional space. Form is any positive element in a composition. It may be related to points, lines, planes and shapes. A form cannot be decoded and understood without referencing the space around it. A viewer must be able to understand and impose some meaning on the relationship between the form and the space it occupies. A viewer must be able to differentiate the form or figure from the space or ground. The artist cannot change the form without concurrently changing the space, thus how things get interpreted and related to. The tension established between form and space determines the extent, time, and motivation of the viewer to interact with that form, and find it satisfying or not. With jewelry, forms are primarily actualized as they relate to and are worn on the body. They convey and solidify the expressive relationships among design elements, person and context. 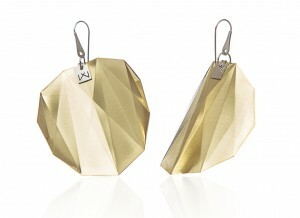 Jewelry forms are not merely structures with wearability. They are expressive design elements which resonate their expressive purpose and power as they are juxtaposed and positioned against the curvilinearity the human body. Form tends to be similar to shapes, but more 3D in reality or implied by illusion. Form can be delineated by light and shadow on it’s surface, whether actual or illusory. 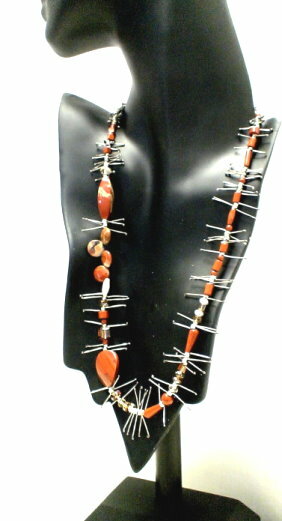 For the jewelry artist, she or he must determine where the point, line, shape and plane end, and where the form begins. This means developing the decoding and fluency skills which can delineate and anticipate what happens to the expressive powers of the jewelry when the piece is worn. The choice of form becomes a primary consideration in communicating the artist’s message and intent. The artist must manage the tensions between form and space, foreground (advancing) and background (receding), object (design element) and structure (arrangement). Forms can have magnetic powers, stickiness, and synergy. Forms can pull your eye in certain directions, or multiply, add, subtract or divide meaning and value, based on positioning, mass and volume. Forms can provide additional control over balance and movement felt within a piece. Themes are ideas which are conveyed by the visual, tactile and contextual experience with the piece of jewelry. Most often themes are implied, rather than explicit. 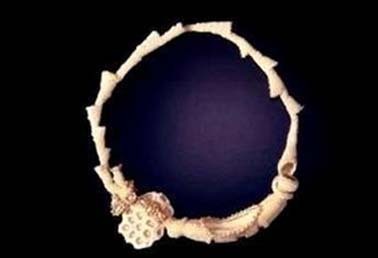 They relate the jewelry to the mind, and cannot be understood apart from the individual or group culture in which the jewelry is worn. Themes are forms which reference, or can be interpreted to have reference, or inflect in some way some reference to individual, group, cultural, societal or universal norms, values and expectations. Themes infuse or imply power, position, protection, or identification. They may be clear or abstract. They may be repeated or not. They may result from interpretations of individual forms, or whole compositions. They may be obvious or they may be symbolic. Well developed themes enhance excitement, interest and investigation. They increase the chances the artist’s design will achieve a level of resonance. Points, Lines, Planes, Shapes, Forms, and Themes are objects used to turn nothingness into something. That something holds meaning, asserts meaning and expresses meaning. Meaning is dialectic, in that how it is ultimately received and interpreted results partly from the fluency of the jewelry designer to use these objects (and other design elements, as well) to translate inspiration into aspiration and aspiration into a finished result, and partly from the various audiences of the designer and their shared understandings about what it means to be finished and what it means to be successful. Arranging these objects into some organized composition provides a structure for them. Both the objects themselves, and the structures they are arranged and embedded in, convey expressive meanings. As these meanings get expressed within shapes, forms and these, their complexity, tensions and implications become deeper and more resonant. At some point in the design process, points, lines, planes and shapes take on the characteristics of forms and themes. That is, the jewelry is no longer decoded as a set of individual parts. Decoding jewelry becomes more contingent on how the jewelry relates to the body (forms) and how the jewelry relates to the individual or group culture within which it is worn (themes). The whole of the composition takes on meaning and value beyond that of the sum of its parts. So, take a moment. Grab a pen and blank piece of paper. Draw a dot. You are now an artist. 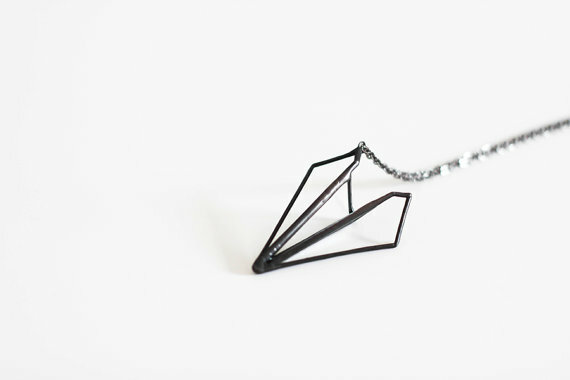 Draw a series of dots, lines, planes and shapes in the form of a necklace. You are now an artist with an interest in jewelry. Jot down some ideas how you would build upon your initial sketch and develop forms and themes. You might re-interpret what you drew as a series of components. You might select other design elements – particularly Color – to better define the forms and establish a them. You are now a jewelry artist. Think about how your developing piece of jewelry reflects your personal inspirations and intent. 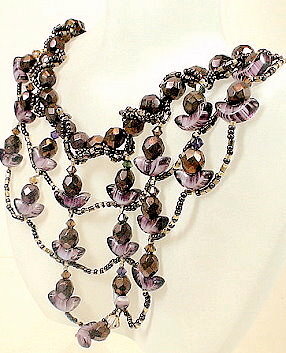 Anticipate how others will view your piece of jewelry and judge it as finished and successful. Think about clues you can look for to reconfirm to yourself that your jewelry has degree of resonance — that others will not just appreciate it, but want to wear it. You are now a jewelry designer. Bradley, Steven, Points, Dots, And Lines: The Elements of Design Part II, Web Design, 7/12/2010. This article incorporates many ideas from this article. 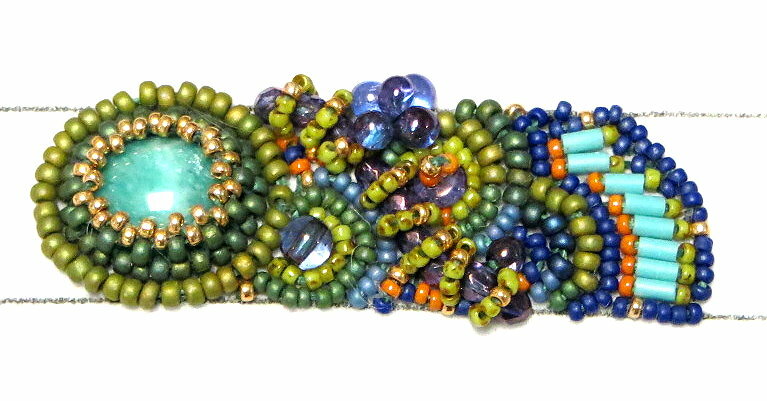 Beading and jewelry making can be so much fun, and you have so many choices of so many beautiful pieces to play with, that sometimes, from a design sense, it’s easy to go overboard. Too many strands. Too many different kinds of beads. Too many colors. Too much embellishment. Too much fringe. Too much repetition of themes and design elements. There is a tendency too often to over-do. How do you answer this question for yourself – when is enough enough? Do you tend to over-do (or under-do) your pieces? How do you edit? Do you make a piece, and get the judgment of others? Is this based on some kind of intuition? How do you work with students or friends who have difficulty answering this question? Could this be better or worse? or more satisfying or less satisfying? I had discussed in an article – 10 Principles of Jewelry Design Composition (http://www.landofodds.com/store/goodjewelrydesign.htm) – what is in effect a type of grammar and vocabulary for good jewelry design. The last principle was called Parsimony. And this one is really difficult to achieve. 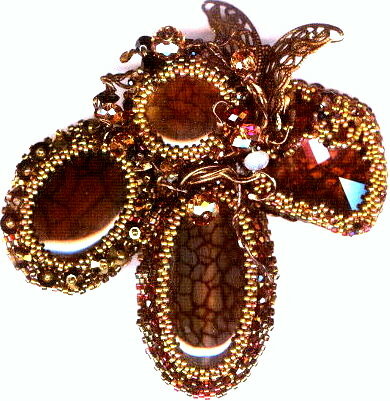 The jewelry artist who is good at Parsimony has a great deal of control over the design process. Parsimony means that there should be no nonessential elements. 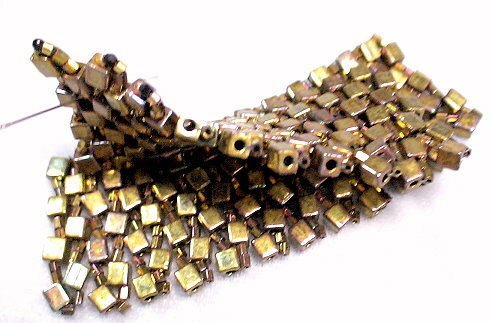 Many jewelry designers, when they like a particular bead, or a particular design, often over-do their pieces. The thinking here is that, if they have a beautiful part, adding many of these parts will make the whole even more beautiful. Often, it results in the finished product that is boring or uninteresting. The finished product loses a type of tension, power and energy. The artist has made a good point with their choices, but then beats a dead horse to death by trying to make the point over and over again, too many times. Good Parsimony shows that the designer has a good sense of the relationship of the parts to the whole. There should be no nonessential elements. More often than not, people over-do, rather than under-do.